Millefiori – also known as murrini – means glass of mosaic appearance. The technique is created by the fusion of a number of colored glass rods into a cane before cutting off thin sections. 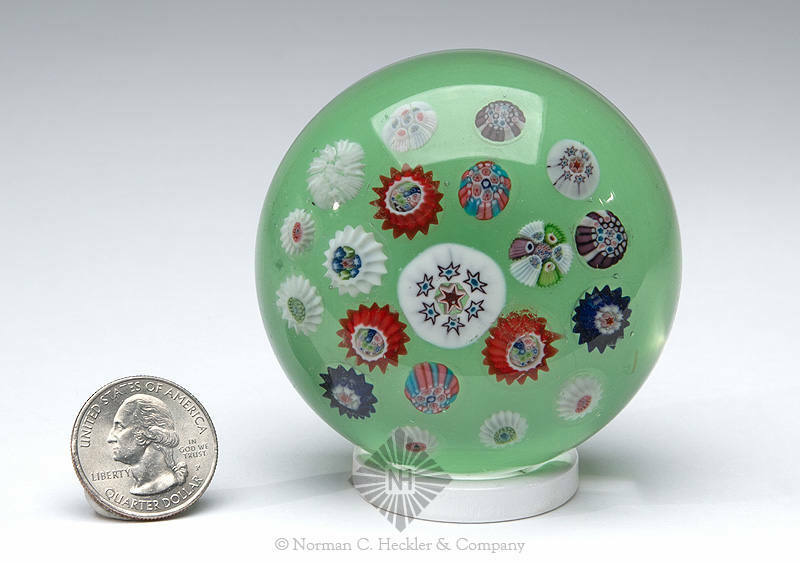 Millefiori is frequently used in the making of paperweights – like the one you see here: a spaced millefiori paperweight, probably made in England sometime between 1920 and 1930. It was lot #131 in Premier Auction 146, an online-only auction of bottles and other glass creations held March 6-15 by Norman C. Heckler & Company, based in Woodstock, Conn. The cylindrical paperweight had a flat base, multi-color decorations on smoky green and colorless ground, and a polished pontil scar. It was diminutive, at just 1 ¾ inches tall, and was in generally fine condition, with a pre-sale estimate of $400-$800, which it blasted through to finish at $8,775. Millefiori is a combination of the Italian words “mille” (thousand) and “fiori” (flowers). Apsley Pellatt was the first one to use the term, in his book Curiosities of Glass Making, in the mid-19th century. It first appeared in the Oxford English Dictionary in 1849.